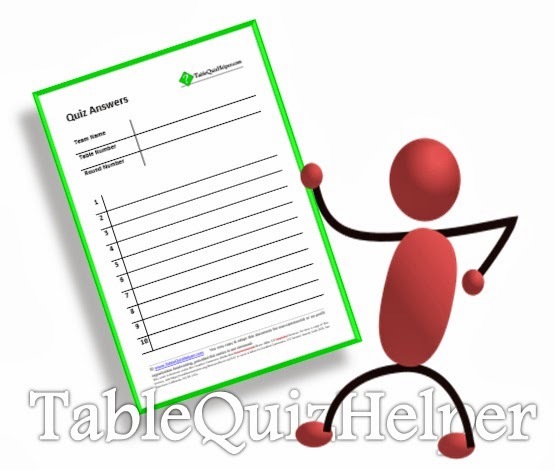 This is a blank table-quiz answer sheet, which quiz-organizers can download and print. At the moment, it is only in one size - full-page (A4). However smaller size sheets (eg half-page, ie A5) can be produced - leave a comment below if you would like these. To start with, there are marked spaces for 10 questions. You may need to change this if you need space for multi-part questions, or if you have less questions in each round. 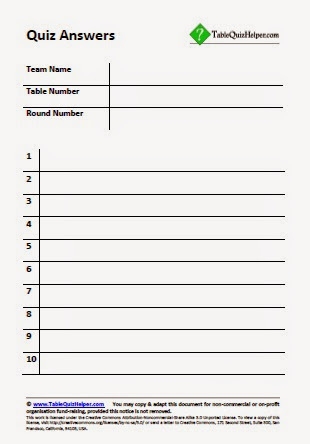 See also: Blank table quiz answer sheets, with round-numbers pre-filled. The empty answer sheet has a title Quiz Answers, and a standard logo. Replace them with your own logo or name, and/or information about your organisation or the one that the quiz is begin run for. If you have less than ten questions per round, either change the form - or just ignore the extra spaces. If you have multi-answer questions (eg "A) name the prime minister, and B) name the president"), you need to either change the form to reflect this - or just split them up into separate questions, so there is only supposed to be one answer on each line. The form is made using Microsoft Word tables. In Word, you can add extra rows by highlighting the row, right-clicking and choosing "Add rows above" or "Insert rows below" (slightly different wording depending on the version you are using).